What makes "Our Potomac, from Great Falls through Washington, D.C." unique is its concentration on just 17 miles of the river - the stretch most accessible to people in the Washington, D.C. metropolitan area. 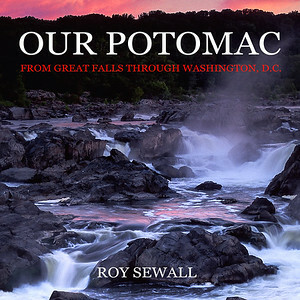 The photographs follow the Potomac downriver to show its remarkable transformation from raging falls surrounded by lush forests to an idyllic setting for many of Washington's great attractions. Area residents who have become familiar with the river will appreciate the way "Our Potomac" honors the sights they cherish. Residents who are still learning about the river will be inspired to continue its discovery. Visitors to the area, who often expect to see mostly government buildings, monuments, and suburbs, will be surprised to learn of the wild natural beauty of the river that is within easy reach. The photographs and text make a gentle but compelling case for the perpetual respect and protection that our river deserves. "Gorgeous, stunning piece of work. "- S.S.
"A magnificent array of photographs - the very best I have ever seen." - P.B. "It occupies a place of honor in our living room where it can be admired by all. The pictures are truly breathtaking!" - P.B. "Clearly reflects an understanding and love for the river and the region." - E.M.
"What a great job you did on that river of ours!" - M.L. "You have a winner, both artistically and as literature." - S.M. "I read it from cover to cover as soon as it arrived. The text and the images support each other so well." - J.M. "It brought tears to our eyes, seeing the many places that have meant so much to us through the years." - M.R. "We will treasure the book forever." - K.S.